Je voudrais avoir un phone. Why on earth would you want a phone? I shouldn’t need to explain this to you. Avec un phone c’est possible to send Madame text messages. All day long. That’s a terrible idea. And why would you even want to do that? Because then I could send Madame a text every time I have le hunger. Les petits Hunger Notifications. That would drive me nuts. You’re always hungry. Because Madame’s cuisine is, how we say, inadequate. You are on a strict diet, honey. Dr. Virk was very stern about that. As well she should be. You’ve been looking distinctly round instead of sleek. Your petty insults, ce n’est pas productive. Je suis toujours sleek. Toujours elegant. For a delusional cat who was rescued from the gritty streets of South Central Los Angeles, you’ve come a long way. But Puff Honey, there’s no getting around it. You have put on the pounds. That’s not healthy. I’m sorry, the diet is necessary. Cette diet, c’est très boring. Je suis Français, I have need for la Cuisine Français. Tasty petits dead animals. Les petits oiseaux aux jus. Teeny tiny birds avec les juices. The French and their songbirds. That’s one form of their cuisine I don’t subscribe to. Je suis sorry that Madame is pathetically ignorant about the pleasures of les songbirds. Next time I catch a chickadee I will prepare it for Madame’s tasting pleasure. The only time you ever caught a chickadee was because that unfortunate bird flew into the house. And I noticed that while you got feathers everywhere, you didn’t consume its tiny sad carcass. There was no opportunity. Madame was as interfering as usual. Ha! In fact, you didn’t know what to do with it. I think you secretly prefer your kibble. Le gourmet kibble, ce n’est rien from which to turn up a nose. But Madame is sadly not very generous. She is vraiment cheap. Trop cheap to provide a sufficiency of kibble. 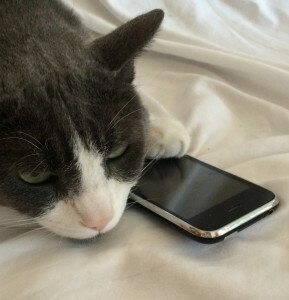 Et bien sûr, too cheap to provide un phone for her distinguished cats. Too cheap to discover for herself le joie of les texting cats.